5001323 LEGO Lunch Box is a Luggage and Lunch Box set released in an unknown year. 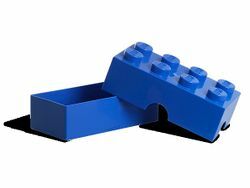 The set is a lunch box, being represented by a blue 2x4 brick, made out of two pieces - a cover, and another piece, where food can be put. This is a description taken from LEGO.com. Please do not modify it. Lunch in LEGO® style! Show your endless appetite for LEGO® building fun with this iconic 2x4 LEGO brick Lunch Box. It's roomy enough to hold 2 Mini Boxes for fruits, veggies, nuts and more. Makes a great gift for LEGO fans! Fit 2 5001382 LEGO® Mini Boxes inside to keep snacks separate! Makes a great gift for LEGO fans! Facts about "5001323 LEGO Lunch Box"
This page was last edited on 9 January 2016, at 18:44.